Preserving your bridal bouquet or drying other floral bouquets is a simple process that will give you lasting memories of a special occasion or dried flowers to use in other applications. 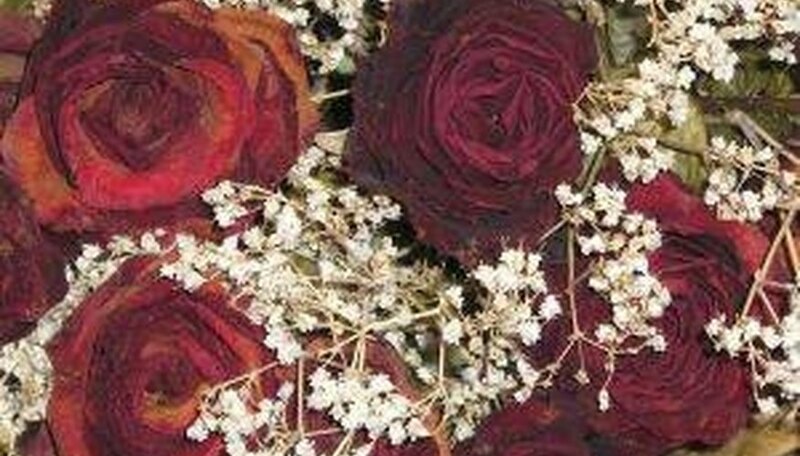 There are several ways to dry flower heads, but the best way to dry whole bouquets is air drying. Depending on the flowers, this could take two weeks or more, but the end result is worth the wait. The dried flowers can be separated and used to make potpourri or new floral arrangements, or the entire dried bouquet can be put on display in your home. String a wire or hang a hook in a dark, dry location where you can leave your bouquet undisturbed for about two weeks. Good ventilation, complete darkness and cool air flow in the room will help your flowers retain more of their natural color. Remove any ribbons or artificial elements within your bouquet, because they may inhibit the drying process. You can always reattach them after the bouquet is dry. Tie a string around your floral bouquet, leaving enough excess to hang your flowers upside down. Hanging flowers upside down is vital to keeping the stems straight and the petals intact. Tie the other end of the string around the wire or hook and leave the flowers hanging upside down for at least two weeks. Larger flowers, like lilies or roses, may take a bit longer than two weeks, and smaller flowers, like baby's breath, will take less time. The humidity in the room is a major factor in how fast your bouquet will dry. Check your flowers after two weeks to see whether they are ready for use. When ready, they will be stiff and dry to the touch, not damp or limp. Display your dried bouquet out of direct sunlight and away from heating vents to help prevent the color from fading.